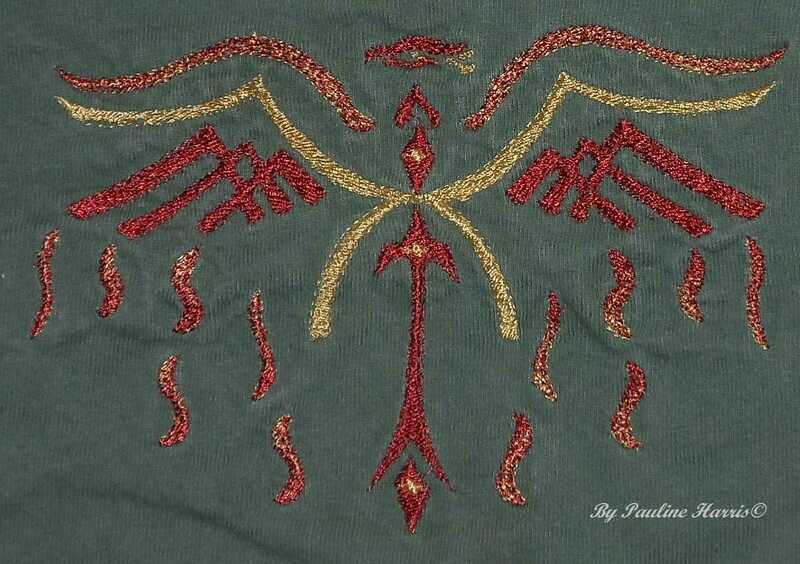 An idea started the whole process of creating this phoenix embroidery. The Firebird is found throughout time and a variety of places. Phoenixes are loyal to those who are loyal to them. They will heal those loyal to them. When Phoenixes die, they are reborn to their lives in order to expand into who they are meant to be. This passionate process of the lives of phoenixes enlightened me to create a representation to carry on. In beginning of creating the firebird embroidery, I began with looking through the many images of phoenixes through the years. The historical phoenix is represented in my rendition of the eye-head. The eye-head allows the viewer to see and observe, then to allow what is learnt to be incorporated into the whole. Within the wings are depictions of mountains representing the many paths we take each day on our journey through life. Flames shaded, here in two colours, express the choices we make each day. The arrow in the center indicates the balance and path we follow leading back to the eye-head. Note: The drawing for the Phoenix was made in the late 1990s. 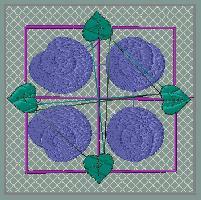 The embroidery was made between 2005-2007, there were many versions of the embroidery as it grew into being. Appliques can done in a few stages. The first stage including setup was to have the design do a outline of where to place the secondary fabric and for the design itself. The second was to place the secondary fabric on onto the design and have the machine do a tack down of this said fabric (in this stage, I have normally done a triple stitch to secure the fabric enough that the excess can be trimmed, but sometimes the trimming is done later…depends on the design and the digitizer). After this step is the underlay n satin stitching. Trim excess fabric and threads. Note…this process is different if making multiple applique or a multiple fabric applique, but this is the general concept.